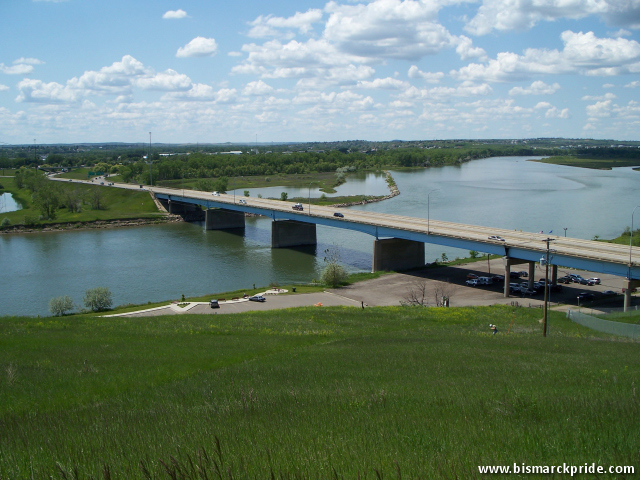 Interstate 94 is the main eastbound highway serving North Dakota, and passes through the heart of Bismarck. The highway crosses the Missouri River via the Grant Marsh Bridge, which opened December 9th, 1965. The opening of Interstate 94 significantly altered traffic patterns through the area, shifting through traffic north. In fact, the interstate was one of the major contributing factors to the business migration from downtown Bismarck. Prior to the completion of the interstate, all eastbound traffic was served by U.S. Highway 10, which ran concurrently with Main Avenue through downtown Bismarck before crossing at the Liberty Memorial Bridge. Many businesses reliant on high through traffic were greatly affected following the opening of Interstate 94, resulting in many closures and a flux of out migration from downtown Bismarck. Businesses located near the Liberty Memorial Bridge were also affected, including the former Holiday Inn. The Grand Pacific and Patterson Hotels in downtown Bismarck were also greatly affected, causing both to closure in the 1970s. The point at which Interstate 94 bisects U.S. Highway 83/State Street exploded with development beginning in the 1970s. Bismarck’s first modern-day discount store, Kmart, was one of the first businesses to open in the area, in addition to several hotels. Gateway Mall opened in 1979. The area near the Grant Marsh Bridge has again sparked a recent boom, most notably the Pinehurst Square Shopping Center.